As we work our way back up to Central Florida from the Keys we have decided to spend a couple of days in a state park that we haven’t been to before that happens to be on our route home. It is very large, approximately 12,000 acres and has two different camping areas, equestrian trials & horses available for trailriding, off-road bicycle trails, hiking trails and the Loxahatchee River. Again we wish we had our tandem bicycle with us, for there are miles and miles of beautiful winding paved and unpaved paths for bicycling. Instead we went hiking & climbed the highest point in South Florida (a whopping 86 ft above sea level, which practically makes it a mountain). 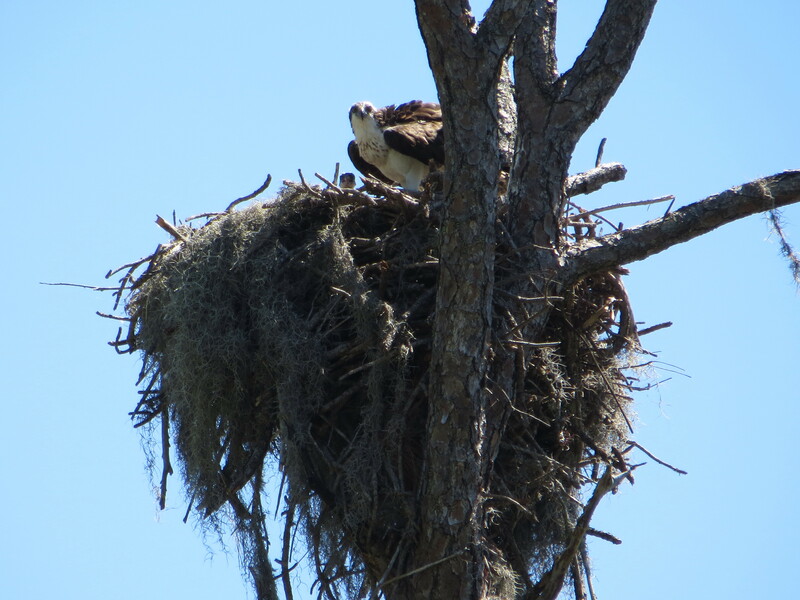 Spring is in the air and the osprey’s are feeding their babies in large nests situated along the trails and river. In the afternoon we decided to go full tourist mode and opted for a scenic boat ride up the Loxahatchee River to the old Trapper Nelson homestead site. Trapper Nelson, aka ‘The Wild Man of Loxahatchee’ was an eccentric fur trapper with a botanical garden and zoo. It’s an interesting site that now belongs to the state and a beautiful ride up the river. It’s always fun to watch the out-of-state tourists get so excited about Florida wildlife (alligators, manatees, turtles, etc.). We also continue to enjoy the wildlife just as much as everybody else and love discovering these large protected areas. The next day we met up with our friend Michael again at nearby Riverbend Park, for an afternoon of canoeing and kayaking. The water was extremely low which made for very tricky manoeuvering in our long canoe. Mike, of course, had no problem in his short kayak. We even had to portage the boats over a waterfall and Mike gallantly came to the rescue of some ladies who had taken on water and were in trouble. They thought he was our guide and were forever grateful. It was great fun. It was his keen eyes that spotted the bird right overhead of us. 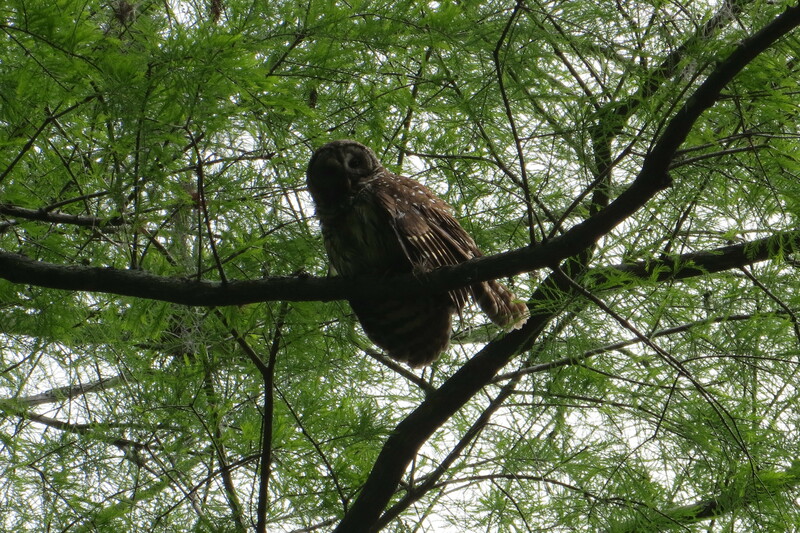 Not just any bird but a Barred owl. We’ve never actually seen one, just heard them. 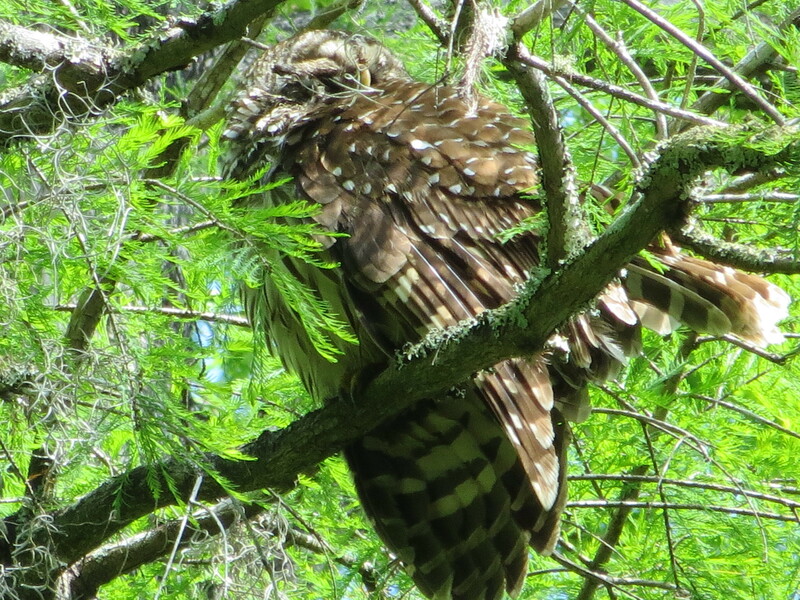 It was busy preening itself and ignored us completely and then eventually its wings sagged down and eyes closed and lo and behold, it fell asleep on the branch right above us. Quite amazing. For some reason I thought it would pick a hole in a tree or some place less busy to rest for the day. We watched it for about 1/2 hr and it appeared to be sleeping soundly. It must have been a busy night. 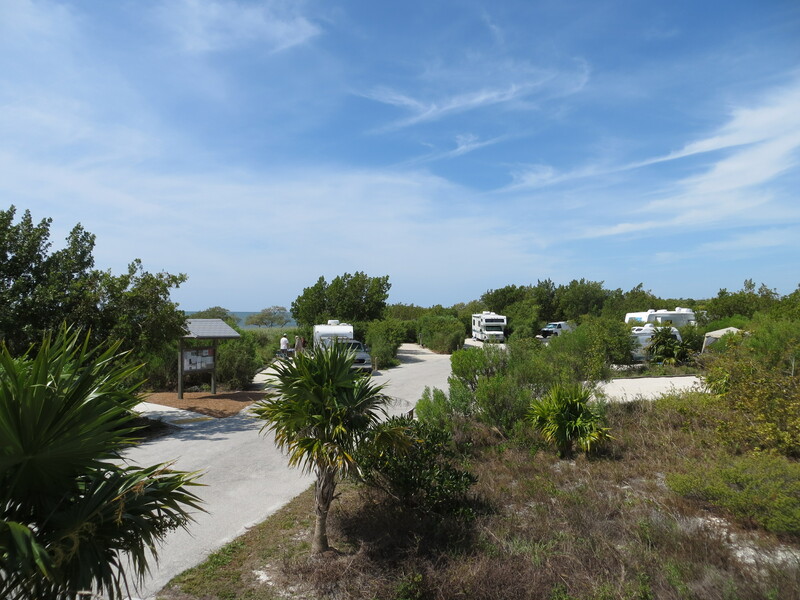 Our 6 days at Curry Hammock flew by and we are now at Bahia Honda State Park, which is a mere 20 miles south on Big Pine Key. 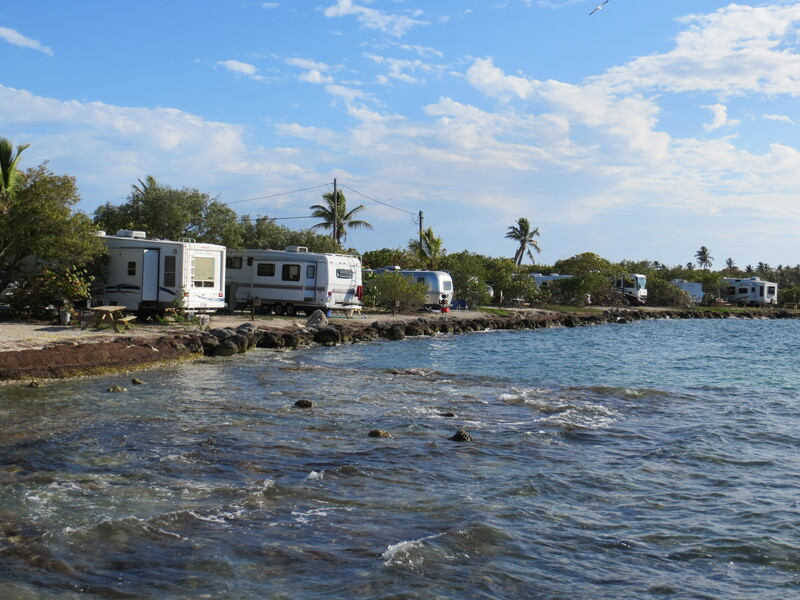 It is a huge park in comparison to Curry Hammock, with 3 different camping areas, a marina, gift shop, snorkelling tours to Looe Key – a nearby barrier reef, and miles and miles of fabulous white sand beach. Our hard work in securing the reservations has paid off for we have scored one of the premium sites that sit right on the water with beautiful evening sunsets (and a few billion no-see-ums when the wind died down). Now that’s low overhead! Incredibly it leads to a campground in the park. Our days here at Bahia Honda passed by much too quickly. We only had reservations for 3 days and 4 nights primarily because we had never camped down in the Keys and wanted to make this trip a reconnaissance mission. We would have liked to go out snorkelling and brought our gear with us, but it has been very windy down here and the boats have not been able to go out and the water still seamed too cold for us thin-skinned Floridians (it was in the mid 70’s). We did see some hardy Northerners frolicking in it as I once used to do, but now I want it to be at least 80 F before I get into it. So instead of being in the water we spent our days doing a lot of walking, exploring the park and watching sunsets over the old railroad bridge. Not such a bad life. Well, here goes the start of me dipping my toes into the realm of blogging. I’ve decided I want to chronicle the travel adventures we hope to have in our small RV (named Trixie) since Leonard’s oh so recent retirement. He is a man in hog heaven these days, with a permanent smile on his face. We made reservations 11 months ago for 2 State Parks down in the Keys that are extremely popular and difficult to get into. It took about 10 days of sitting in front of the computer at 8am when the reservation system came online to finally score the sites and they were worth the battle. 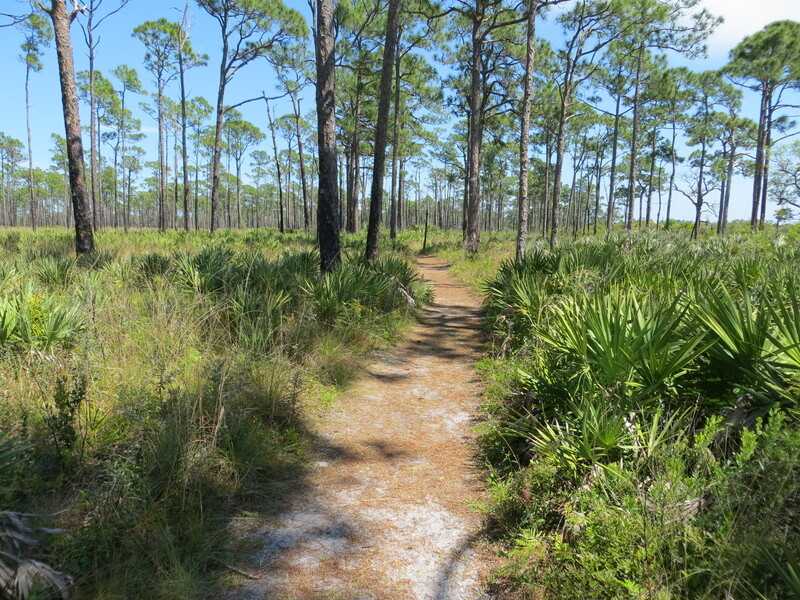 Curry Hammock State Park is on Little Crawl Key, adjacent to Marathon and is a small, relatively new State Park, with only 28 campsites. 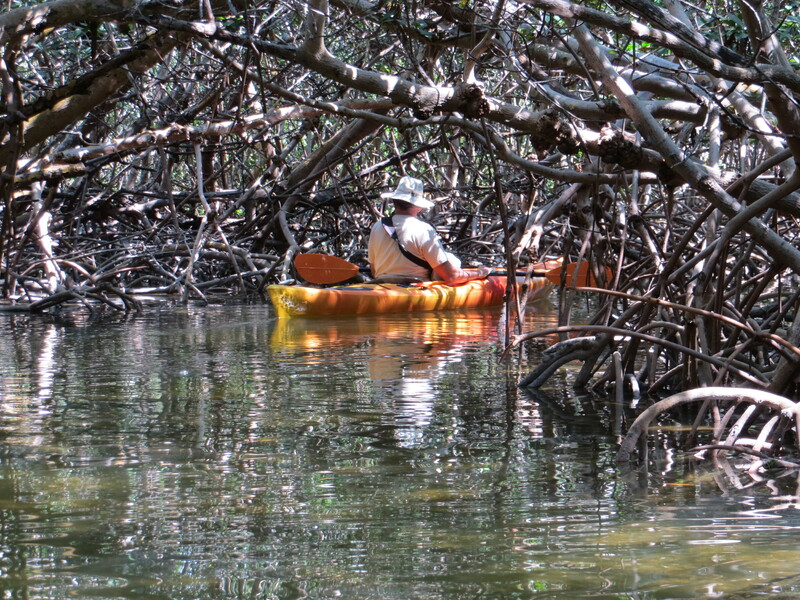 It faces the Atlantic and has mangroves around three quarters of it so it has great kayaking opportunities. It has been quite windy the past few days so we will have to wait until the wind dies down before we can venture out in our canoe. 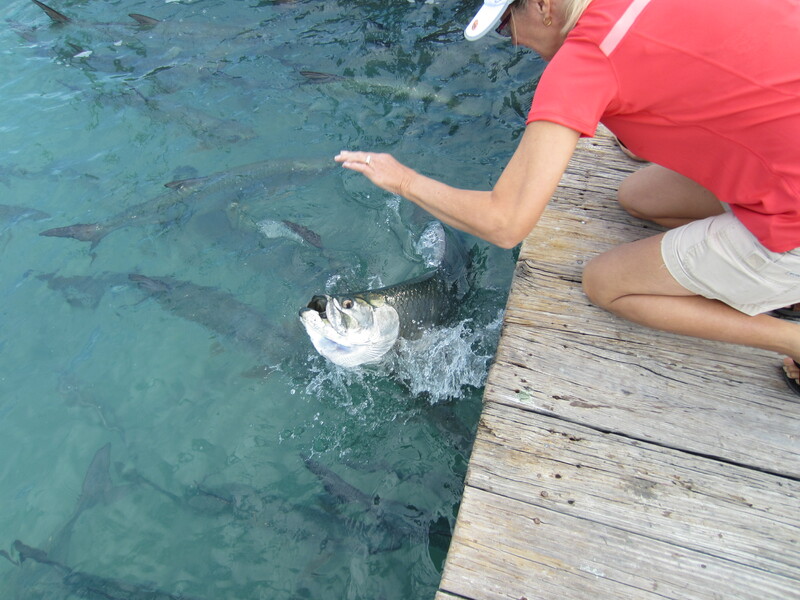 The tarpon are waiting for a handout. hand itself if you’re not quick enough! 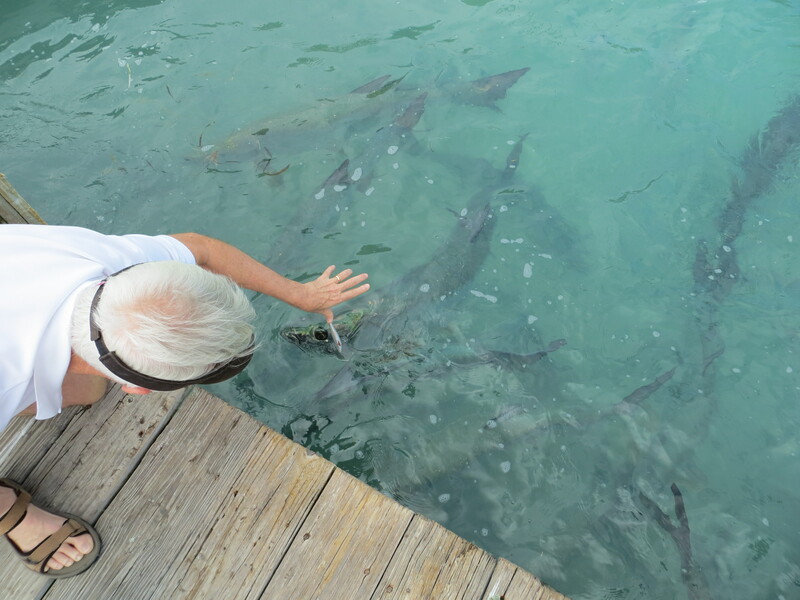 What a thrill, but you have to be quick because between the tarpon and the pelicans it is a race over who is going to get fed first. 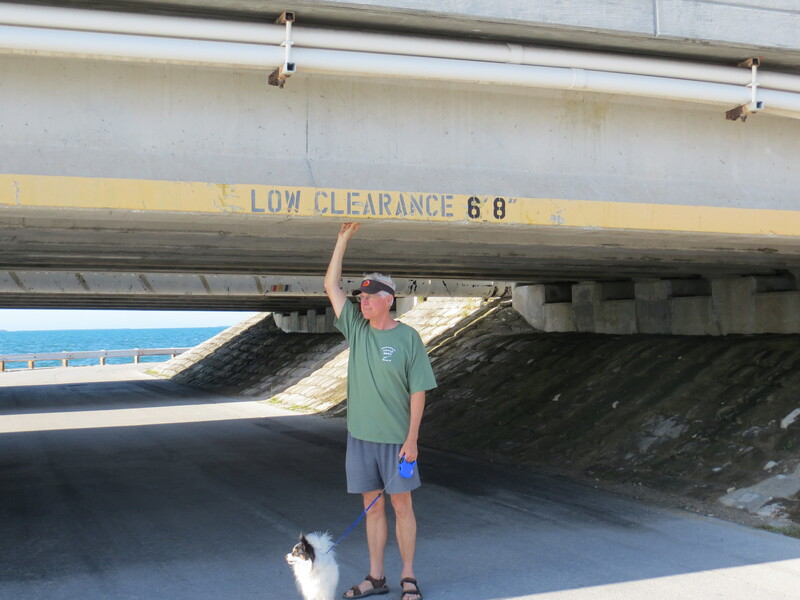 Today it is still too windy to go canoeing so we have decided to check out Pigeon Key. A friend of ours has joined us for a few days and we will take a boat out to the Key which was used by Henry Flagler in the early 1900’s when he built the railroad down to Key West. 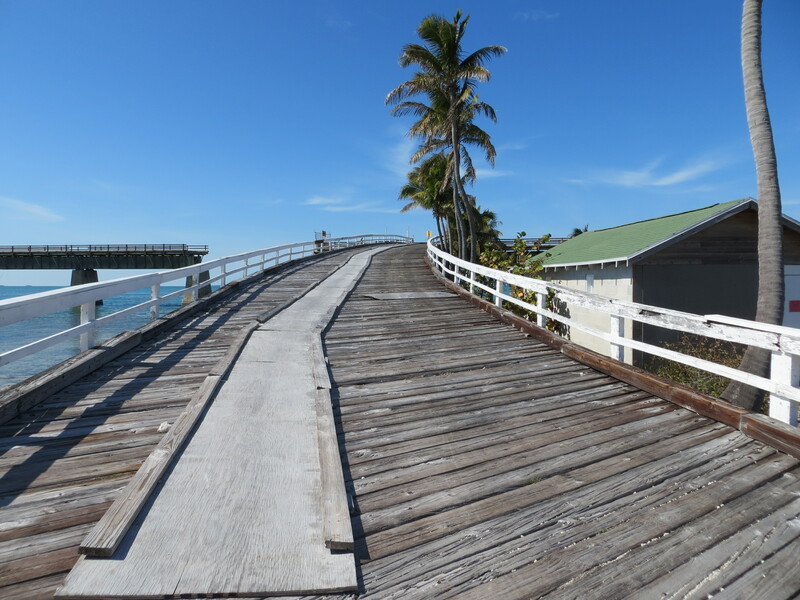 while he built the 7 mile bridge and it still has historic buildings remaining on it. 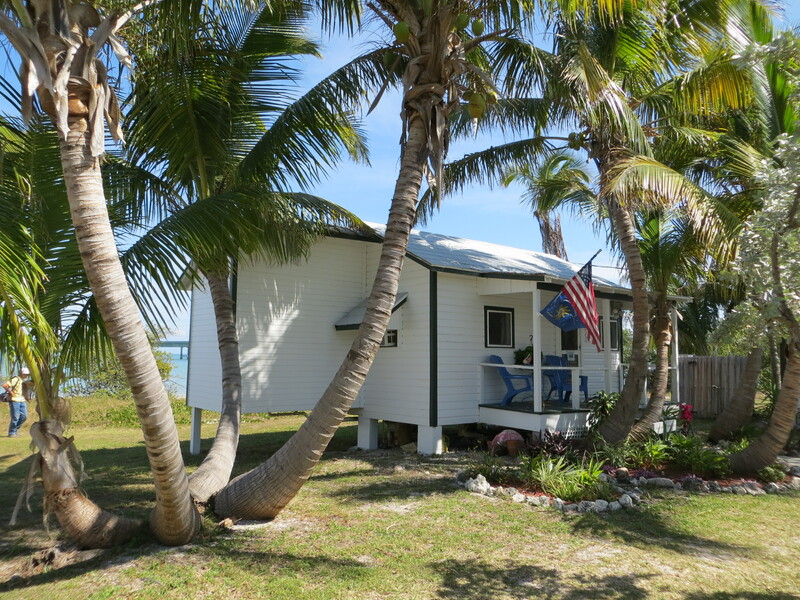 When the railroad was converted to a highway in the late 1930’s Pigeon Key was used as a rest stop, and even had a one hour Honeymoon Cottage for rent! Rather than return by boat we chose to walk back along the 2.5 mile portion of the old bridge that still stands. It was perfect walking weather with clear blue skies and not too hot, and along our stroll we saw tarpon, a shark and a stingray. There were also many people riding their bicycles along the bridge which looked like fun, so next time we will have to bring ours. We have seen many places that would have been fun to ride on. A local watering hole overlooking the water with live music was the perfect ending to the day. Finally the time has come and the wind gods are smiling upon us and we get to go out on the water. 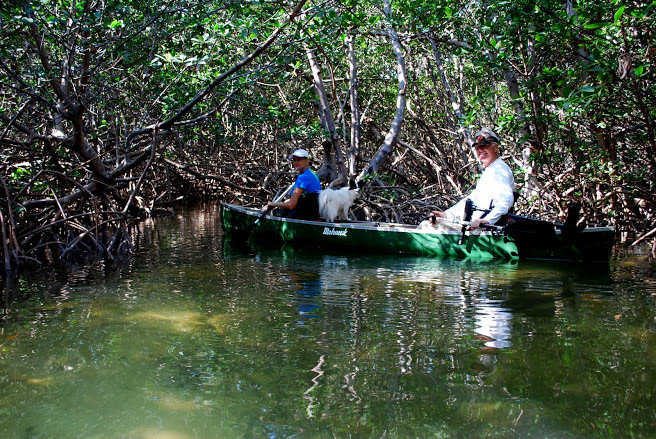 We’re off to explore the mangroves that are everywhere around here and in order to do that we will have to go through the mangrove tunnel! How cool is that. Leonard and Laia in the mangrove tunnel. 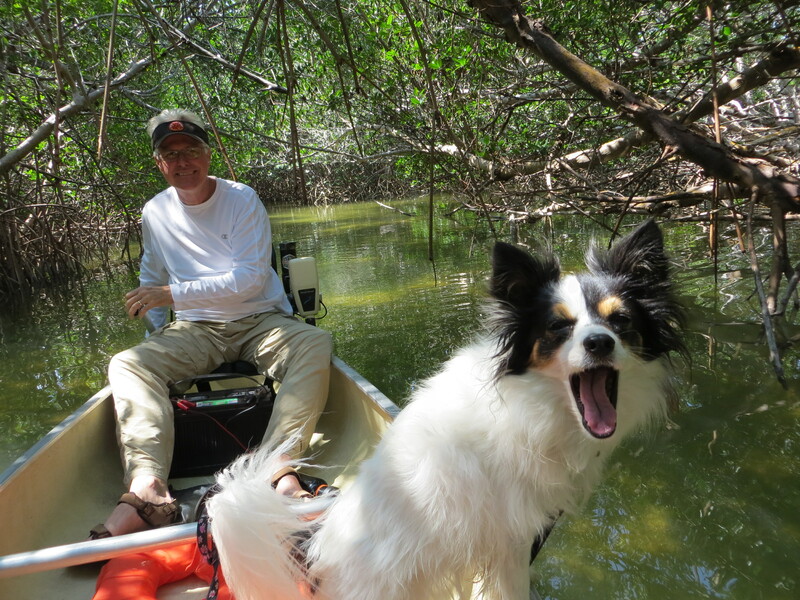 Our friend Mike in the mangrove tunnel. easy to negotiate and once at almost low tide when it was very shallow with a lot of rushing water. That was a lot more work! The nearby lagoon had lots of bird life and we were lucky enough to see a couple of sea turtles.